One cell-phone factory employing 8,000 people in southeast India may be the stumbling block for Microsoft’s $7.17-billion Nokia acquisition, delaying the entire process by up to six months. According to The Wall Street Journal, the factory is the critical element of a tax audit being conducted by the Indian government. Until the deal clears regulatory approvals, it can’t go through. Normally, however, “regulatory approval” means the approval of regulators like the Federal Trade Commission or the Department of Justice. But since Nokia—as well as Microsoft—have a worldwide presence, other governments get a say in how the deal affects them, as well. Nokia’s factory in Chennai, in the southern Indian state of Tamil Nadu, remains the subject of negotiations with authorities who have blocked it from becoming part of the Microsoft transaction, according to the paper. The Indian government believes that Nokia hasn’t paid all of its taxes to the government, which could reach into the billions of dollars, according to the Journal. Specifically, the government wants Nokia to pay up to $3.4 billion in “future liabilities,” plus additional taxes due to the Tamil Nadu government itself. Nokia, for its part, has said that it will contest the tax claim, the paper said. The original deal, announced last September, was worth $7.17 billion. Technically, it consisted of 5.44 billion euros, or $7.49 billion at today’s conversion rates. Microsoft also agreed to pay an additional 1.65 billion euros to license Nokia’s patents, plus 1.5 billion euros ($1.98 billion) in convertible notes that Nokia can exercise. Microsoft, however, has already begun planning for the deal to close. 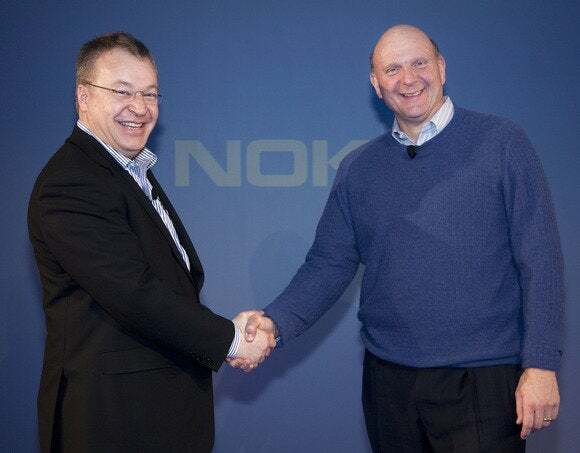 On Monday, Microsoft named Elop chief of the Devices team, as expected, once the deal closes. “The mobile capabilities, hardware design expertise, and world-class manufacturing and supply chain operations they [Nokia] bring will help us drive innovations in devices to delight our customers,” Microsoft chief executive Satya Nadella wrote in a letter the company published on its Web site.